The season of Lent is an opportunity and a challenge to look again at my fears, at what holds me back, at what is keeping me unreceptive, writes Sister Catherine Slattery. “Are you ready?” the young man asked as he checked the rope connecting me via belts and clasps to an elaborate system of pulleys, tethers and anchors. “Yes”, I squeaked, my heart beating wildly and trembling knees almost folding under me. With a deep breath I leapt out into space, abseiling over a cliff for the first time in my life. But not without tears, not without clenched jaws and a burning desire to stop this runaway train, to bail out. Despite the reassurances of the professionals guiding me, despite the encouragement of my friends waiting in line for their turn, the act of leaping backwards into the air, 200 metres above the valley floor, remained a source of terror. Now there was no turning back. It was too late to pull out. Sheer momentum carried me to the edge of my personal abyss. That jump occurred nearly 20 years ago, but the experience is embedded deeply in my being; it is still a source of new learnings and deeper understandings. The absolute exhilaration of the descent down the cliff face is without parallel in my own experience of physical challenges. Yet, when I do consciously recall the whole event, it is not so much the elation as the fear that first comes to mind; fear of letting go of time-proven supports like standing on firm earth and walking forwards towards what I can see, shoulder to shoulder with fellow travellers. The challenge of abseiling is to step out backwards, connected but alone, into the air, trusting that the ropes will hold. The season of Lent is an opportunity and a challenge to look again at my fears, at what holds me back, at what is keeping me unreceptive. Who or what am I unable to see or hear? What habits of mind and heart are generating their own momentum, distracting me, splitting my attention as a crystal scatters light? What leap am I being invited to take into a future that is as yet unclear? During my lifetime, Lent has suffered from a degree of bad press and inadequate preaching, often regarded as a time to be endured, a time to embrace discomfort if not suffering, a time to ‘do without’, an extended period of penance. As a young sister I remember leaving the chapel after community prayer one evening at the beginning of Lent and heading for a sparsely-laden dinner table. We walked in silence but I could hear an indistinct murmur coming from the direction of an elderly sister. “I hate Lent; I hate Lent,” she kept mumbling like a mantra under her breath. It made me smile but I also empathised with her position. The seemingly exclusive Lenten imperative to “repent” had become a burden, a repetitive reminder of personal inadequacy, an incessant exposé of failure. God seemed distant and disappointed. So how are we today to hear the invitation of Jesus so central to the full Lenten call to “repent and believe in the Good News” (Mark 1:15; cf Matthew 4:17)? Easier access to Scripture scholarship is a gift of our times. Insights into language and translations open up new pathways to understanding and appreciating the richness of the Gospel message and new possibilities for encountering Jesus. The full meaning of the Greek word metanoia is difficult to capture. As demonstrated in the quote from Mark 1:15, metanoia is often translated as “repent” or “be converted” or “change”. However, it means far more than just one single event or even a repeated act of thinking, feeling or willing. Metanoia only happens in the context of encounter: we encounter the Risen Jesus who personally invites us into relationship; who calls each of us by name. “I have redeemed you; I have called you by name: you are mine” (Isaiah 43:1). This is the very essence of the Gospel of Jesus: that we are loved absolutely and unconditionally by God who desires to be in relationship with us. In this context, metanoia can be understood as an invitation from God whom we have encountered in Jesus – an invitation “to dare to see differently”, as Australian Scripture scholar and Josephite Sister Michele Connelly has described it. If we can dare to believe this Good News, then we can only respond with full hearts and “go and do likewise” (Luke 10:37). To ‘dare’ implies courage, the refusal to give in to fear, accepting that events are mostly not under my control, but still willing to stay in the moment, whatever that may ask. To “dare to see differently” is both a disposition of heart and mind as well as a call to be alive to my circumstances. So my questions become: What can’t I see? What do I miss or not notice? How have I stopped paying attention? How has fearfulness narrowed my focus and blinded me to larger truths? The Gospel call may not require me to leap over a cliff, but Lent remains an opportunity to change my position, to step down from the pedestal of my opinion, to acknowledge my own limitations. The season of Lent is one of profound invitation: to open my eyes; to listen anew; to allow my hardened heart to soften; to seek forgiveness. Only then can I be dazzled again by goodness, tethered securely to the beauty and truth that surround us all. Catherine Slattery is a Sydney-based Sister of the Good Samaritan. 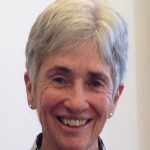 As an educator, Catherine’s particular focus in recent years has been sharing Good Samaritan Benedictine spirituality through the development and delivery of faith formation programs for adults. She continues to be challenged by our world’s deep hunger for connecting with and enriching the life of the spirit.